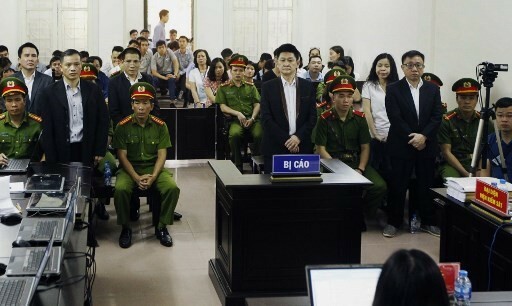 A Vietnamese democracy activist was sentenced to 13 years in prison Tuesday for "attempting to overthrow the state", just days after six of his colleagues were also handed heavy jail terms in the one-party state. Communist authorities have been accused of vigorously targeting critics over the past two years since a hardline administration took charge. Amnesty International says at least 97 prisoners of conscience are behind bars, including pro-democracy and environmental activists, bloggers and rights lawyers. Hanoi denies a coordinated crackdown. The latest to be jailed is Nguyen Van Tuc, a 53-year-old member of the outlawed Brotherhood for Democracy activist group which says it has about 80 permanent members nationwide. He was accused under Article 79 of the penal code of trying to topple the government. "Tuc admitted he was a member of the Brotherhood for Democracy. He admitted he had been fighting for democracy, but denied his alleged attempt to overthrow the state," Tuc's lawyer Ngo Anh Tuan told AFP after a half-day trial in Thai Binh province east of Hanoi. "The result of the trial was of course not what we wished," Tuan added. Tuc was previously convicted for anti-state propaganda and sentenced to four years in prison after handing out political leaflets in 2008. He has called for multi-party democracy and has been outspoken on maritime issues regarding Vietnam's claims in the disputed South China Sea. Tuc's daughter Nguyen Thi Mai told AFP her father looked weak at Tuesday's trial and insisted he was not guilty. "My father said he did nothing wrong, he only fought for democracy and justice, he did not commit any crime. He said he was innocent and I believe him," Mai said, as her mother wept nearby. The verdict comes after six activists linked with Brotherhood for Democracy were sentenced last week at a high-profile trial held under heavy security in Hanoi. The most prominent among them was lawyer Nguyen Van Dai, who got 15 years in prison -- the harshest sentenced doled out to an activist in years -- while the remainder got between seven and 12 years. The jail terms sparked outcry from the international community, including from the United States, the European Union, Britain and Germany, who issued harsh rebukes. Independent civil society organizations, political parties and media are all banned in Vietnam.